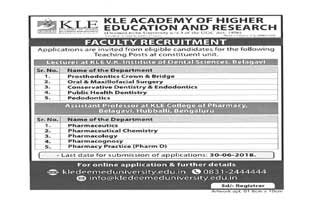 KLE College of Pharmacy Bangalore has advertised in DECCAN HERALD newspaper for the recruitment of Teaching Faculty- Assistant Professor jobs vacancies. Interested and eligible job aspirants are requested to apply on or before 30th June 2018. Check out further more details below. About College: K.L.E. Society’s College of Pharmacy was established in 1968 in the pleasant environs of J. N. Medical College, Belgaum, with the aim of providing quality education in pharmaceutical sciences. The courses started with, Diploma in Pharmacy (1968) followed by B. Pharm (1975), M. Pharm (1988), the Ph. D Programmes (2000), M. Sc. In Clinical Pharmacy (2013) and eventually Pharm. D (2014). The College of Pharmacy is run in a spacious well-equipped building of its own with hostel, library and sports facilities. support of qualification and experience on or before 30th June 2018. Reference: Advertisement from KLE College of Pharmacy Bangalore on DECCAN HERALD newspaper dated 20th June 2018 for the recruitment of vacancy position such as Assistant Professor and non-teaching faculty jobs. See the copy of advt below.